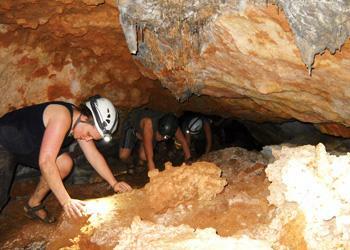 CERTAINLY ONE OF THE LARGEST CAVE SYSTEMS IN BELIZE WITHIN THE BLUE HOLE NATIONAL PARK. 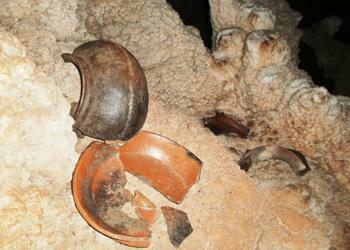 We’ll take you on a journey into the past, following the footsteps of the ancient shamans as they traversed into the Mayan underworld “Xilbalba”. This cave will leave you wonder-struck with it’s huge caverns adorned with beautiful stalactites & stalagmites, flowstones, rock columns, crystalline formations & Maya artifacts. On top of that, witness age-old evidence of rituals & ceremonies such as potteries, beads, fire pits, charcoal ash & skeletal remains calcified in the limestone floor. Firstly, our day starts at 7:30 AM with an 1hr. & 20 minutes drive to the park. At the Blue Hole site, an orientation awaits us by the park rangers. Then at this point, we usher out water & gears then follow our guide on a 45 minutes hike to the cave entrance through the forest. To enter the cave, there’s the option of rapelling 30 ft. downward or climbing down using natural hand holes & pockets in the limestone. These ancient rock formations, seemingly glittered in diamonds, will amaze you. This cave has been named one of the 10 best caves in the world by the National Speceological Society. After 3+ hours of cave exploration we head back with the option of stopping at the Blue Hole for a refreshing dip. Included: Lunch, soda, water, helmet with head lamp.